DTweak is one of the best and most complete tools for the general optimization of the system. As well as having a wide array of tools to improve the computer's performance, it also has access to the systems own tools. 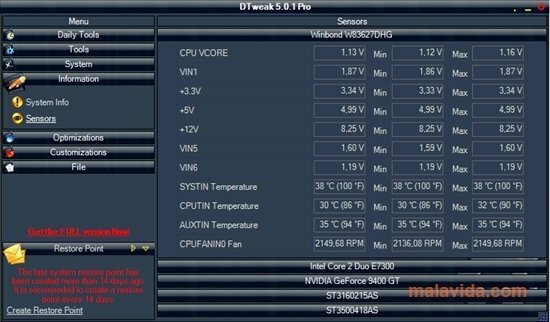 With DTweak you will be able to maintain your computer in the best conditions for it to offer an optimum performance. As well as these functions, DTweak can also configure your computer's security features, or adjust the optimization by means of the visual effects. From DTweak we will have direct access to our operating system's tool, like for example, the calculator. 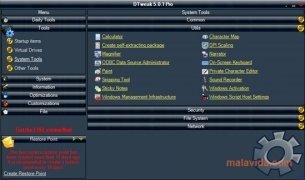 But the best thing about DTweak is its ease of use, that will really please both new as well as experienced users, because it also offers the possibility to configure the most complex parameters. 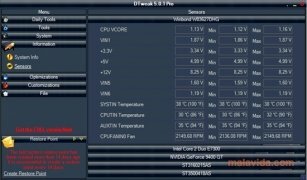 DTweak is the complete tool for your computer to work perfectly. The trial version can be used for 10 days. The program is specially designed to optimize for the Windows Vista operating system.